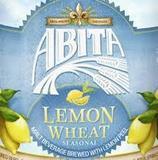 Lemon Wheat is a crisp, refreshing beer made with lemon peel for a fresh citrus taste and aroma. This brew is an excellent choice with many dishes. It pairs wonderfully with salads if the dressing is not too sweet. Great with shrimp, lobster or any fish, even the most delicate.